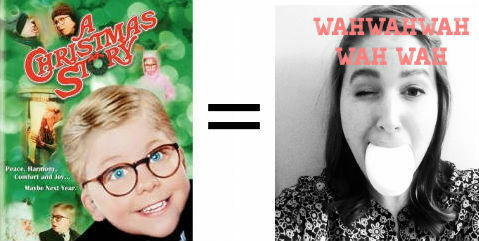 Last night, on the eve of Christmas, I watched “A Christmas Story” for the very first time. I’ve never seen it even though TNT runs it for 24 hrs on Christmas Eve every year! So, in the spirit of the holidays, I sat down with my uncle, mother-in-law, and husband to watch this 1982 classic. And while the movie is an entertaining piece of Christmas humor, it is also quite educational. 1) The holiday season can be stressful. 2) But don’t let it get to you. Holiday rage is a real thing. Calm yoselves people! 3) It’s necessary to bundle up when it’s cold out. 4) But don’t worry. You can put your arms down when you get to your destination. 5) Remember that the holidays are about friends and family, not commercialism. 6) Let’s be honest: Santa IS a bit creepy sometimes. 7) Be thankful for every gift you receive, even if you hate it. It means that someone loved you enough to get it! 8) It’s really hard, but try not to overeat. It will make your New Year’s resolutions that much harder! 9) Some cultures celebrate Christmas differently or not at all. 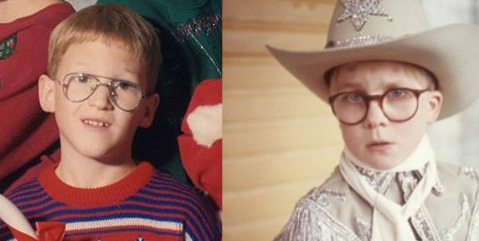 And that’s ok.
10) If you’re lucky enough to get a Red Ryder Range Shot 200 BB gun from Santa – be careful! You might shoot yer eye out! Merry Christmas, friends and a Happy New Year!